Cary-Grove Team 3 captured first place in the McHenry County College (MCC) 2019 Marketing Challenge. Pictured with their team trophy are, from left, Gabriele Eidukeviciute, Viktoria Cowen, Lilly Hicks and Emily Mueller. Richardson Adventure Farm owners challenged area high school marketing students to find ways to make the Spring Grove-based farm more relevant to teenagers’ lives. 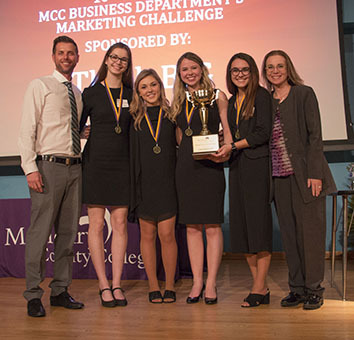 Top marketing students from five area high schools accepted the challenge and presented their ideas at the McHenry County College (MCC) 2019 Marketing Challenge. For Cary-Grove High School’s team 3, their marketing talents, strong sales pitch and enthusiasm earned them first place in MCC’s 2019 Marketing Challenge, where 60 students from five area high schools competed to create the best marketing plan for Richardson Farm, this year’s sponsor. The 2019 Marketing Challenge Champion team includes: Gabriele Eidukeviciute, Viktoria Cowen, Lilly Hicks and Emily Mueller. They took home a traveling trophy and each team member received a scholarship for one free three-credit class at MCC. Crystal Lake Central team 3 placed second and Crystal Lake Central team 2 placed third in the competition, sponsored by the MCC Business Department. The winning Cary-Grove team proposed ideas that Richardson Farm owners said they plan to implement this year, including boot scrapes at the farm exits, bringing in more “influencers” and expanding their presence on Instagram. Ryan Richardson, sixth generation co-owner of Richardson Adventure Farm, said he was impressed with the winning team’s philanthropy plan and using QR codes. “This event was really valuable for us,” Richardson said. “The students’ feedback was really relevant and appreciated. Other ideas that students presented included targeting teenagers on Instagram and adding themed events throughout the year, including Easter egg hunts, a Haunted corn maze, hayrides, geocaching, and a fishing derby and ice skating on the newly constructed spring-fed lake. For Andrew Khoury, senior at Prairie Ridge High School, the Marketing Challenge helps students build effective communication skills. All of the student competitors researched demographics and conducted a Strength, Weakness, Opportunity and Threat (SWOT) analysis for Richardson Adventure Farm, which is family owned for six generations and boasts the World’s Largest Corn Maze. Students were judged on company knowledge, creativity, visuals, and media strategy, including the use of social media. MCC business instructor and 2019 Marketing Challenge chair Julie Freelove said the goal of the event is to give high school students and future business leaders in marketing real-life experiences and to have fun. A new feature this year was an online student choice voting, where the students voted for their favorite of the three finalists.